Registration is closed. Please join the email list to learn of upcoming events. Are you a fan of sweater knit fabrics, but have yet to take that big step and sew your first sweater? Do you fear cutting into this stretchy fabric that sometimes frays and runs? Then this announcement is for you. 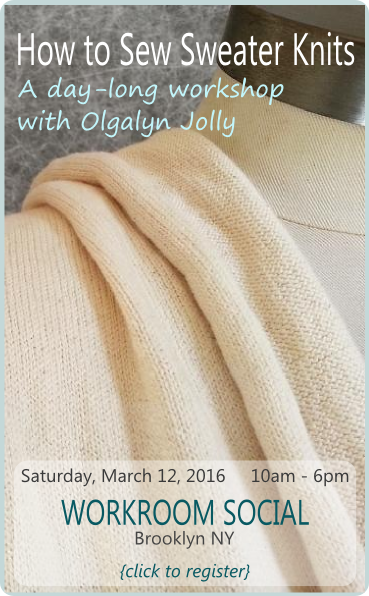 I'll be teaching How to Sew Sweater Knits at Workroom Social in Brooklyn on Saturday, March 12, 2016. It's an all day workshop, 10:00 AM to 6:00 PM, lunch and treats included! Registration is now closed. All day will give us time to cover the basic techniques for seams, edge finishes, and stabilization, and to learn specific strategies for handling this sometimes challenging fabric. I'll discuss how to select a sewing pattern, and I'll show how to lay out a pattern on this type of material. You'll learn a very satisfying approach to sewing sweater knit fabrics and have fun while you work to complete a pullover sweater. Let's face it -- pretty as they may be, some sweater knits are more unstable than others. That's why we'll be working with specially selected, natural fiber fabrics from the shop (available at a discounted student price). I wanted to be sure that each student would be starting with a sweater knit that's user friendly, whether the student is relatively new to sewing or a sewer with more experience. I'm sure you know I love these fabrics. It'll be great to share my enthusiasm with you face to face! Please click through to Workroom Social for more info on the workshop. While you're there, be sure to check out the rest of website. Studio owner Jennifer Wiese has recently moved from her lovely former studio to a beautiful, bigger studio that's so perfect for sewing and design. 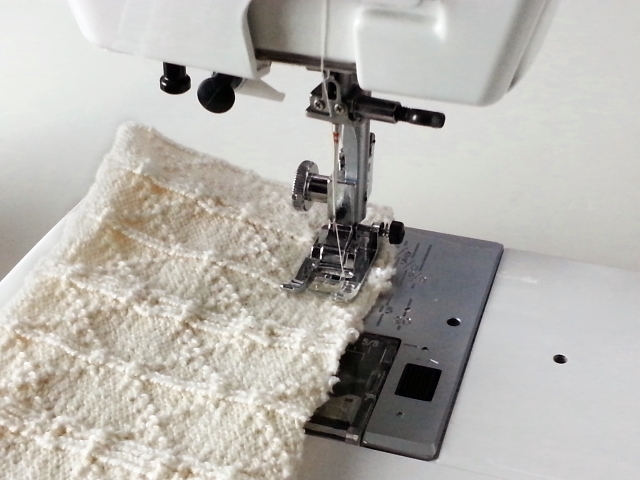 I'm very happy to be introducing the joy of sewing sweater knits in this very creative place.